The Schubert shelves bend and groan and are full to overflowing, but they’ll have to find room for one more. This is a simply unmissable recital, for two prime reasons – the grave beauty of its programme and the corresponding beauty of the singer’s voice. Here’s an artist who clearly takes his art very seriously and marries it to a loveliness of even-voiced tone and a sensitivity of response to all that he has to sing. The selection and collocation of songs are wonderfully made so as to define a particular frame of mind and sustain and develop it. The haunting Schiller setting ‘Die Götter Griechenlands’, with its ghostly evocation of the Rosamunde Quartet, is seminal. Throughout the recital, an occasional harmony or melodic sequence recalls it to mind, and the horns of ‘Griechenland’ are heard faintly blowing in the last song of all, the Mayrhofer ‘Abschied’. These are ernste Gesänge, every one of them, yet there is nothing meanly austere or ponderously sententious. These songs of yearning, essentially spiritual, are very personal, and the imagination never shuts down. The pianist, Ingo Metzmacher, is fully responsive to this, and the recorded sound, of both voice and piano, is warm and vivid. Bostridge’s gift for finding the right manner for each song is exemplified in the contrast between the easy simplicity he brings to such apparently artless pieces as ‘Fischerweise’, ‘Frühlingsglaube’ and the less familiar ‘Im Haine’ (this a wondrous performance of a song that’s the very epitome of Schubert the melodist), and the depth of feeling found in ‘Erster Verlust’ (a properly intense reading), ‘Nacht und Traüme’, ‘Wandrers Nachtlied’ I and II, ‘Du bist die Ruh’ (so elevated in tone and style) and ‘Litanei’. Bostridge also characterises spine-chillingly the intense, immediate drama of ‘Erlkönig’ and ‘Der Zwerg’, though here some may prefer the weight of a baritone. In the latter piece Drake is particularly successful at bringing out the originality of the piano part; and in a much simpler song, ‘An Sylvia’, he gives to the accompaniment a specific lift and lilt that usually goes unheard. In these songs, as in everything else, the ear responds eagerly to the tenor’s fresh, silvery tone and his ever-eager response to words. The recording and notes are faultless. With few exceptions, Christian Gerhaher ventures well off the beaten track in this superlative recital centring on the echt Schubertian themes of wandering, evanescence, night and lost or unattainable love. In his classic study of Schubert’s songs (Duckworth: 1928), Richard Capell wrote of the rare ‘An den Mond in einer Herbstnacht’, somewhere between a Lied and an operatic scena, that it ‘would reward an uncommon singer possessing art enough to maintain the interest for all of its length’. I suspect Capell would have given the nod to Gerhaher, in close partnership with the sentient Gerold Huber. With his lyric high baritone at its freest, Gerhaher has the uncommon gift of making everything alive, specific, while always sounding natural. Each shift of perspective in ‘An den Mond in einer Herbstnacht’ – say, the sudden stab of fear at the vulture gnawing the soul, or the lightening of gait and spirit at the memory of boyhood – is vividly caught. Yet the abiding impression, here and throughout this recital, is of spontaneous directness, tempered by a certain restraint. In the Gothic ballad ‘Der Zwerg’ Gerhaher eschews grotesquerie, making his effects by understatement and the plangency of his perfectly controlled pianissimo singing. The song emerges less as melodrama than as a mysterious human tragedy. ‘Herbst’, that bleak late masterpiece, is likewise elegiac rather than anguished, with Gerhaher cherishing the sculpted beauty of Schubert’s melodic line. He can be charming, too, as in the lazy barcarolle ‘Der Schiffer’ and the pastoral sway of ‘Abendlied an die Entfernte’, where Huber gives a delightful lift to the 6/8 rhythms. Several of the little-known early songs here look slender on the page. But with his Schubertian gift of mingled simplicity and vitality, Gerhaher makes something cherishable of the limpid, Mozartian ‘Nach einem Gewitter’ and the Baroque-inspired ‘Hoffnung’. In two settings of the troubled Saxon poet Ernst Schulze, ‘Im Walde’ and ‘Über Wildemann’, Gerhaher catches the anguish and desolation without ever compromising beauty of tone and breadth of line. Gerhaher and Huber end their programme with a real rarity, ‘Der Sänger am Felsen’, a strophic song of rather formal, classical cut. But they vindicate their choice with a performance of gentle eloquence and grace. Each successive verse is freshly, naturally, illuminated, with no conscious point-making. It crowns a superlative recital by a singer who for vocal beauty, poetic insight and expressive immediacy is surely unsurpassed in Lieder today. This is an unusual and wholly absorbing recital by a soprano often, mistakenly, considered no more than a singer with a lovely voice. In 1972, at the height of her appreciable powers, Janowitz impressed her Salzburg audience with this, her first recital at the Festival. Her discerning choice comprises some notable songs by Schubert rarely heard in recital and ones by his contemporary Hüttenbrenner, which Janowitz sang from manuscript copies, seldom performed since the composer’s day. These are surely their first recordings. Has there ever been such a lovely, poised account of the great Schiller-inspired song ‘Die Götter Griechenlands’ or such an ingratiating one of ‘Sehnsucht’, the Mayrhofer setting? The first offering, ‘Im Freien’, has its winning cantilena filled with gloriously sustained, long-breathed tone. The programme ends with ‘Einsamkeit’. 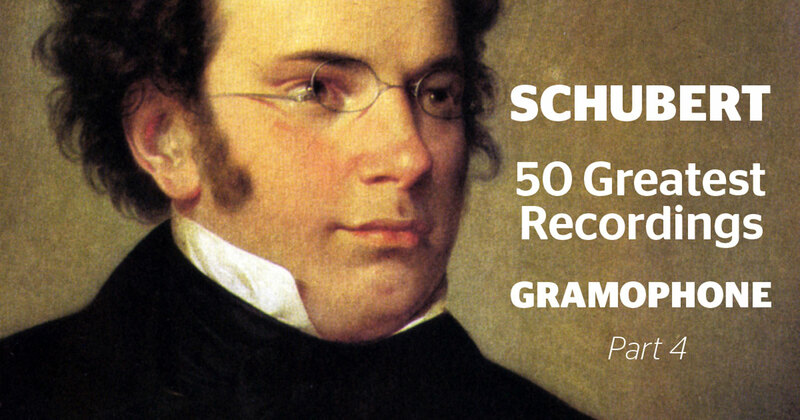 This grandly imaginative if slightly impersonal quasi-cantata, to a Mayrhofer text, a composition that Schubert himself thought so highly of, is a kind of a panorama of a life, ending in a wonderfully reposeful final section. Janowitz and her impressive partner perform it with total conviction, sustaining interest throughout. Although not in Schubert’s class, Hüttenbrenner reveals a talent apparently well able to encompass the meaning of poems in fluent and often imaginative writing. Orfeo provide no texts, let alone translations, but the delightful ‘Spinnerlied’ must be about spinning: it’s an artlessly charming song. ‘Der Hügel’ is obviously about more serious matters and, in its sad course, comes closes to Schubert in depth of feeling. ‘Frühlingsliedchen’ has a simple, spring-like joy to it, and an appealingly varied, strophic form. Janowitz takes the measure of them all, and adds to a gently vibrant tone many tints and touches of half-voice. They could not have a better advocate. The recording catches the full glow of the singer’s voice. The only drawback, that absence of texts, isn’t serious enough to stop acquiring this issue, given that Janowitz virtually tells you in her utterance what the songs are about. Terfel’s gift is a generous, individual voice, a natural feeling for German and an inborn ability to go to the heart of what he attempts. His singing here is grand in scale – listen to any of the dramatic songs and the point is made – but like Hotter, whom he so often resembles, he’s able to reduce his large voice to the needs of a sustained, quiet line, as in ‘Meeresstille’. When the two come together as in ‘Der Wanderer’, the effect can be truly electrifying, even more so, perhaps, in ‘Erlkönig’, where the four participants are superbly contrasted. Yet this is a voice that can also smile, as in ‘An die Laute’and ‘Die Taubenpost’, or express wonder, as in ‘Ganymed’, a most exhilarating interpretation, or again explode in sheer anger as in the very first song, the strenuous ‘Gruppe aus dem Tartarus’. Terfel isn’t afraid to employ rubato and vibrato to make his points and above all to take us right into his interpretations rather than leave us admiring them, as it were, from afar. Throughout, Martineau’s at once vigorous and subtle playing is an apt support: his accompaniment in ‘Erlkönig’ is arrestingly clear and precise. It’s hard to know where to begin in praise of this disc. It has several centres of excellence, the first being Schäfer’s beseeching, urgent account of the Mignon settings from Goethe’s Wilhelm Meisterthat make plain her pre-eminence among sopranos in Lieder. Next comes Ainsley’s winningly fresh account of ‘An Silvia’. You may be surprised at how wholly new-minted Ainsley’s ardent tones and Johnson’s elating piano manage to make of such a hackneyed song. Schäfer and Johnson do the same service for ‘Horch, horch! die Lerch’’. Then comes the extraordinary discovery of this volume. As a rule, Johnson has excluded unaccompanied vocal pieces from his project; happily, he has made an exception in the case of the astonishingly original Seidl setting ‘Grab und Mond’, which touches on eternal matters, or rather the permanence of death, a message starkly expressed in typically daring harmony. The London Schubert Chorale gives it a spellbinding interpretation and also contributes positively to a performance of another Seidl setting, the better-known ‘Nachthelle’, where the high-lying tenor lead provides no problems for Ainsley. There have to be reservations over the work of Richard Jackson; his tone is inadequate to the demands of ‘Der Einsame’, the unjustly neglected ‘Totengräberweise’and ‘Der Wanderer an den Mond’,which call for a richer sound-palette. Throughout, Johnson’s playing is a source of pleasure and enlightenment. The recording is well-nigh faultless. The only really famous work here is ‘Der Wanderer’, that archetypal expression of Romantic alienation whose popularity in Schubert’s lifetime was eclipsed only by that of ‘Erlkönig’. Some of the part-songs – Zum Punsche, Naturgenuss and Schlachtgesang – cultivate a vein of Biedermeier heartiness that wears a bit thin today. Nor will Schubert’s consciously archaic tribute to his teacher Salieri have you itching for the repeat button – though, like several other numbers, it shows the 19-year-old composer rivalling Mozart in his gift for musical mimicry. To compensate, though, there are part-songs like the sensual Der Entfernten, with its delicious languid chromaticisms, and the colourful setting of Gott im Ungewitter. The slight but charming setting of ‘Das war ich’ is appealingly done by the light-voiced Daniel Norman, and Ann Murray brings her usual charisma and dramatic conviction to the pathetic Italian scena Didone abbandonata. Christine Schäfer is equally charismatic in the neglected ‘Die verfehlte Stunde’ (recorded here for the first time), catching perfectly the song’s mingled yearning and ecstasy, and negotiating the mercilessly high tessitura with ease. Other happy discoveries include Schubert’s third setting of ‘Des Mädchens Klage’, with its soaring lines, a melancholy tale of courtly love, sung by Christoph Prégardien with as much drama and variety as the music allows, and the surging ‘Entzückung’ (‘music for an infant Lohengrin’, as Graham Johnson puts it), for which Toby Spence has both the flexibility and the necessary touch of metal in the tone. Doubts were fleetingly raised by Lynne Dawson’s slight tremulousness in ‘Des Mädchens Klage’ and by Christopher Maltman’s prominent vibrato at forte and above in an otherwise involving performance of ‘Der Wanderer’. But, these cavils apart, no complaints about the singing or the vivid accompaniments. This disc, the last in Hyperion’s Schubert Edition, is in large part devoted to the per-formance of the non-cycle Schwanengesang, that extraordinary collection in which Schubert seems more original and more inclined even than in earlier Lieder to peer into the future. Johnson has astutely divided the songs between two voices. Ainsley is given the Rellstab settings, Rolfe Johnson the Heine plus Seidl’s ‘Die Taubenpost’, which so poignantly and airily closes the set. Ainsley interprets his songs with the tonal beauty, fine-grained phrasing and care for words that are the hallmarks of his appreciable art, even if his voice sometimes lacks a difficult-to-define individuality of timbre. The over-exposed ‘Ständchen’ is given a new spontaneity of utterance by both the singer and Graham Johnson. Anthony Rolfe Johnson brings all the appropriate intensity one would expect from him to the tremendous Heine settings. Sometimes his tone hardens when he’s depicting the deserted lover present in so many of these pieces but that’s hardly inappropriate to the depth of feeling being expressed. Most of the other songs of 1828, which open the recital, are assigned to Schade, who sings them with refined tone and an innate feeling for sharing his enjoyment in performing them, nowhere more so than in the opening ‘Auf dem Strom’. Ainsley reads his sole offering here, ‘Bei dir allein’, with just the fiery passion it calls for. This is a worthy, often inspired conclusion to the series, once more enhanced by Johnson’s copious notes. It also has a complete index to the Edition. The recording is faultless. You wouldn’t think that a recording by Fischer-Dieskau, given his huge Schubert discography, could still offer an exciting revelation – but that’s what this ‘new’ Die schöne Müllerin recording offered when it was released in 2000. Explanations for its suppression vary. The singer seems to think it has something to do with its technical quality: the booklet-note, slightly more credibly, tells us that it was planned before DG decided to include the cycle in its ‘complete’ Schubert with the baritone and Gerald Moore, which caused this performance to be put on the back burner. Now we can enjoy a reading that’s absolutely spontaneous, daring in its dramatic effects – bold extremes of dynamics, for instance – and full of even more subtle detail than in Fischer-Dieskau’s other recordings. This approach owes not a little to Demus’s piano. As Alan Newcombe says in his notes: ‘Aided by Demus’s lightly pedalled, often almost brusque staccato articulation, the result is starker, more elemental, less comfortable [than the reading with Moore], conceived on a larger scale.’ To that one should add that the singer is at the absolute height of his powers; tone, line, breath control and intuitive imagination are most remarkable in the strophic songs that, in lesser hands, can seem over-long. Another feature of this is the significant underlining he gives to pertinent words. For instance, in ‘Pause’, note how ‘gehängt’, ‘durchschauert’ and ‘Nachklang’ receive this treatment. It’s this unique vision of the German language in music that still marks out this baritone from his many successors. Immediate, unvarnished sound heightens the value of this extraordinary performance. An enthralling account of the cycle on virtually every count that seriously challenges the hegemony of the many desirable versions already available. In the first place, Güra must have about the most beautiful voice ever to have recorded the work in the original keys (and that’s not to overlook Wunderlich, a far less perceptive interpreter). Its owner has a technique second to none, able to vary his tone, sing a lovely pianissimo and/or a long-breathed phrase with perfect control. Then no musical or verbal subtlety seems to escape him at any stage of the young man’s disillusioning journey from happiness to misery and death. The plaintive quality of his voice and its youthful sap are precisely right for conveying the protagonist’s vulnerability and, where needed, his self-pity. ‘Der Neugierige’ encapsulates these virtues, with the final couplet of questioning the brook immaculately done, just as the pp at the close of the previous song is given a curious sense of uncertainty on the boy’s part. The three strophic songs are finely varied: here, as throughout, the use of rubato is natural and inevitable, and the integration of singer and pianist, who’s happily playing a Bechstein, are at their most compelling. ‘Mein’ is properly eager, expectant, ‘Pause’ as plangent as it should be, especially at its end. The frenetic anger of the 14th and 15th songs is as over-heated as it should be, ‘Die liebe Farbe’ rightly hypnotic. In ‘Trockne Blumen’ and ‘Der Müller und der Bach’, both artists go to the heart of the matter, and the final lullaby is soft-grained and consoling. Schultsz’s contributions are sometimes controversial, always challenging. Güra surpasses even the Gramophone Award-winning Bostridge, simply because his voice is under even better control and because his German is more idiomatic. The Harmonia Mundi sound, in spite of some reverberance, catches voice and piano in ideal balance.